After a thorough research and testing, here is best sight for bow list you may want consider for your bowhunting adventure. The first bow sight on this list that I’d recommend for both beginners and longtime shooters is the IQ Bowsights Micro 3, 5 or 7 Pin Compound Bow Archery sight. Frankly, this is one of my best compound bow sights. This is because the design of this bow sight is well-thought out to cater for the needs of both seasoned and beginner archers who want to hunt down deer. Design wise, the bow sight is made of aluminum and comes with a fiber optic to maintain great brightness in every light situation. Also, it features a Retina Lock Technology that lets you shoot at long-range distances while allowing you to ascertain the slightest anchor point change. Whether you want to shoot from a treestand or on a flat ﻿ground, the Retina lock ensures you have a consistent and more accurate shot no matter your shooting position. Our test and research revealed that the Retinal Lock isn’t affected by elevation. You can adjust the individual pin to suit your shooting style. Thanks to its micro-adjust knobs that let you adjust the windage and elevation to accurate positions with the help of the adjustment markings. Even without an Alan wrench, you can decide to move each pin up and down. So, are the Retina lock and the fiber optic battery powered? Both of these features work off-battery. Although you may want to use the battery on your sight for the first 10 minutes and last 20 minutes of shooting time, after that, the retina lock and the fiber optics gather light from the sight to run both. What are the numbers of pins? The sight comes with 3, 5 or 7 Fiber Optic Pins that are easily adjustable. So, that means you can use any number of pins you think that will best suit you. But I think you are going to love using the 7 pins. The only downside to this is that the windage adjustment knobs can cause a bit of noise and vibration. But if you don’t want to use the windage feature, you can have it removed and decide not to use it. Another thing you shouldn’t be ignorant of is that the pins aren’t preset for different yards like what you may have from other models. That means you have to set the pins anytime you are setting the bow. The HHA Optimizer Lite 5519 has been garnering raves of positive reviews and comments worldwide due to the impeccable features that set it apart from the competition. The design of this bow sight is rock-solid and well-constructed to last you a lifetime. It offers fully protected fiber optic, making it one of the toughest, and most dependable one pin bow sight for low light shooting in the morning that eliminates the clutter you get from multiple pins. It comes with a free-tool elevation and windage adjustments that let you turn your optimizer easily in the field. The optimizer features yardage tapes, and its single pin doesn’t come with any sort of vibration or noise. Our testing revealed that this sight offers impressive accuracy at 20 yards and still maintains its pinpoint accuracy even if you move back to 40 yards. This will give you the confidence and motivate you to start shooting at longer yardage. The sight is easy to install and you can easily adjust the distance before shooting. You can dial in on time and start shooting as if you have been using the sight for years. Even from the very first day of using this bow, you will notice that your shooting accuracy will improve. The adjustable optical pin light is a spot on. 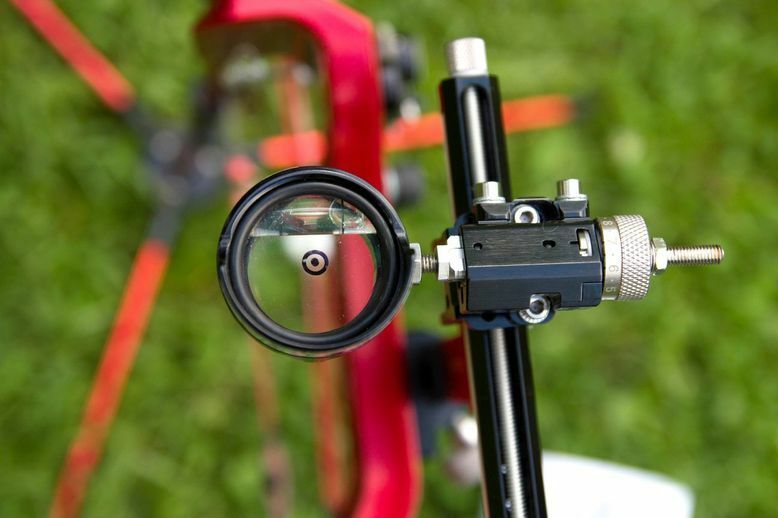 This helps you to control the brightness and intensity of the pin by turning the outer housing of the bow sight. The reason I love this feature is that it helps you adjust the strength of the brightness of the pin in both low light and bright situations. 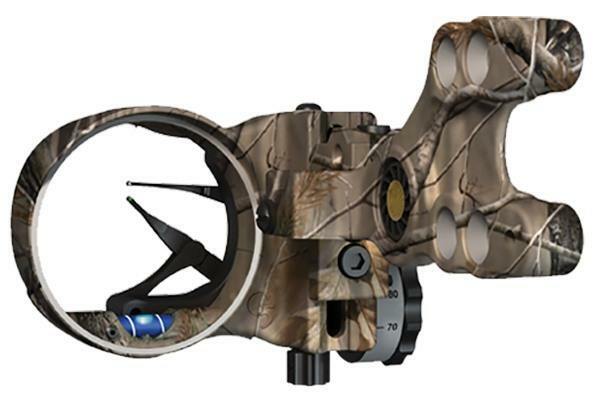 Did I mention that this bow sight also gives you the option to add a magnifying lens on the front? This will make a huge difference as it gives you a clear and bigger view of the target in front of you. The only downside with this HHA bow sight and as to other single sights is the fact that it will be quite a hassle adjusting the yardage when you have a prey in front of you. This is where multiple stationary sights will come in handy. 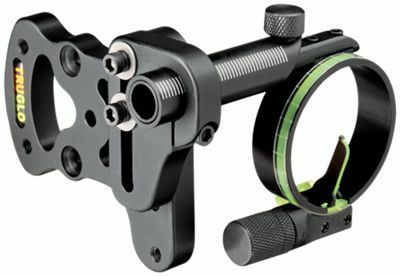 But, if you have had issues with multiple pin sights, and you are looking for a single pin sight, we highly recommend you give this best single pin bow sight a try. Imagined drawing your ﻿bow with the confidence that you will definitely hit the bullseye, wouldn’t that be awesome? Well, that is the kind of confidence you will get from the Trophy Ridge React 5 Pin Bow Sight. The React is a game-changing bow sight that is skillfully built to enhance your accuracy on any target. It comes with a lightweight and solid design and it is very easy to adjust both horizontally and vertically. While its younger brother offers a Single pin, the React provides you with 5 fiber optic pins that stood out. It also followed the same step of its brother by offering very bright pins. Once you calibrate it at 20 and 30 yards, its React Technology automatically sets your 40, 50, and 60-yard pins to achieve the cleanest precision. I love how easy and accurate it allows you to dial in the 50 and 60 yard ranges with just a few adjustments. With an Allen wrench, you can easily install this best 5 pin bow sight to mount on your bow. One of its downsides is that it doesn't give you downloadable instructions or real instructions on the various adjusting knobs. You can calibrate it at 20 and 30 yards to give you the cleanest precision. This bow sight is known as the best bow sight for hunting that will make you a better shooter right from the very first day. The Wrapped Hogg is a tough sight that is ruggedly built and well-made to last you for a very long time. This is a freestyle sight that is easy to adjust, and it’s very accurate. This bow sight comes with all the bells and whistle of high-end bow sights. It features an adjustable knob and tapes that are accurate and clear. It also features a good 2nd and 3rd axis adjustment. It is a single pin sight that allows you to have a clear view of what you are aiming at compared to multiple pins. So you don’t have to keep adjusting the pins—all you need is to find the range and then adjust the dial on the side. You just need two yardages and the next step is to set up from 20 yard---100 yards, which is much better than setting pins while going to every 10 yards. This bow sight is made of aircraft aluminum and comes with a vertical and horizontal calibrated gang. It also features a machined aluminum guard to give you maximum pin protection and durability. Although it doesn't have micro adjustments, it does have a Photochromatic technology that prevents the fiber optic from turning so bright. Thanks to its impressive revolutionary SkyCoil which gathers light for unprecedented pin brightness when needed. You will also be surprised to know that the pins darken the bright light automatically to dull pins to eliminate pin halo. It also offers a quick peep alignment, thanks to its Fluorescent interchangeable guard rings and with its adjustable level, you can easily set your 2nd axis. The Trophy Ridge is a single pin sight that is much cheaper than most sights on the market. Even at a cheaper price, the Trophy houses an aluminum design that is durable and sturdy. Its simple construction and bright pin are one of the unique reasons why this bow sight was able to make it to our top list. It has a single vertical pin that comes with a sight’s ultra-precise adjustments and Delrin bushings that has a quiet movement without any metal-to-metal contacts or vibration. The glow in the slider scale and dark ring are visible and bright. The pin is brilliantly bright in low light situations. You can adjust the brightness of the pin to suit any visible condition and also to maintain accuracy even in low and changing lights. One of the cons that let it down is that it doesn't have sight tapes. And there is no adjustment knob, meaning you’d need a number of Allen keys to adjust different parts of the sight. Trophy Ridge bow sight also comes with the problem of the screws on the slider, causing damage to the riser. But you can put nylon washers in between the riser and the sight to prevent this from happening. Of course, if this is not checked on time, then it might have a negative impact on the overall accuracy. If you are looking for a best 3 pin bow sight that is perfect for a beginner or a pro hunter, or looking for something that won’t break the bank, this might be what you are looking for. Although it houses a plastic material, it is well made to last you for a long time. It comes with two Adjustable vertical bars for both left and right-handed shooters and also markings for windage and elevation. However, I did notice that the pins are large and the fiber portion has a little length to get enough light collection. So, this wouldn’t be great if you decide to use it in a low light situation. The level of this bow sight is super small and quite difficult to see. Bow sights come in different shapes and sizes. We are going to look at the different types so you can have a clear picture of which one works best for you. The first most common type of bow sight is the fixed pin ﻿bow ﻿sight﻿. The reason why this is widely used by hunters is that it is easy to set up and very accurate when used properly. Most of this sight offer the option to use a different number of pins for setting numerous distances. We recommend you set one pin from 20 to 25 yards, which is the average shooting range for a closer shot. But do ensure you always learn and practice how to aim high for a closer or longer shot no matter the number of pins you are using. Just as the name implies, moveable pin allows you to adjust the pin to any given distance when taking a shot. 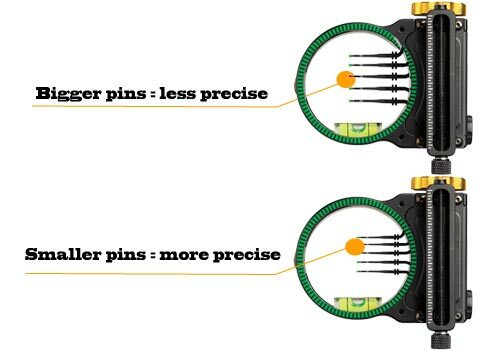 The big difference is that they come with just a single pin compared to a fixed pin sight that gives you the option to use as many pins as you want. To get the distance of the shot, you will need to mark the shot through a slider preset. So, that means you have to adjust it to the accurate distance for every single shot you take. And this can be a hassle if you have a prey right on the spot that is constantly moving. Even worse, the deer can spot every move as you make adjustments, and off it goes. We normally recommend this type of bow sights for ﻿3D ﻿and competition shooting. You will need to constantly adjust the pin to any given distance in order to take a clean shot. Pendulum sights are unique in a way that they come with a different design as opposed to other types of bow sights. They offer a pin that is mounted on the pendulum, which is located inside the bracket. This type of bow sight is suitable for a ﻿﻿tree ﻿﻿﻿stand hunter as it allows accurate positioning and downward angle of the bow. So, you will notice that as you take a shot, the pendulum, which is inside the bracket, will swing outside the bracket, paving the way for a precise shot on target. Target sight is one of the most expensive and accurate sights around. You can attach this sight with another aiming device like single pins and lasers for extreme accuracy. It comes with a lot of settings and flexibility to give you the free hand to adjust to suit the wind or distance you are aiming at for a precise and accurate shot. Brackets sights are divided into two parts: the fixed and dovetail. The fixed brackets sights allow you to remove the sight even when it has been set up. And it is more durable than the dovetail bow sight. The dovetail sight, on the other hand, comes with a secured fixed plate and a slot to slide the sight onto the fixed plate with a screw. 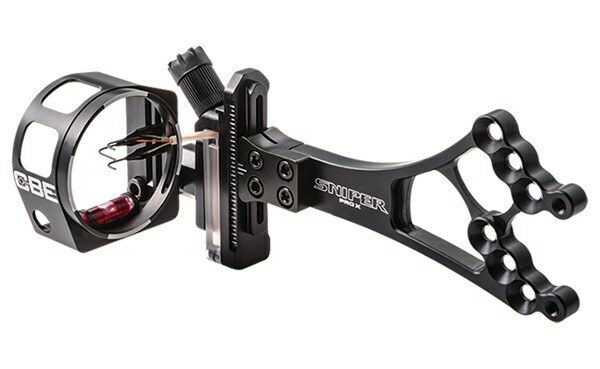 It allows you to move the sight forward and backward to suit your bow setup. Typically, this gets the sight far away from the riser and allows you to aim more precisely and accurately. I collected top ones below for you, so keep reading! There are a lot of key factors you want to consider before picking a bow sight. Since archery sights come in different styles, design, and purposes, you want to make sure you choose the one that fits your hunting style. 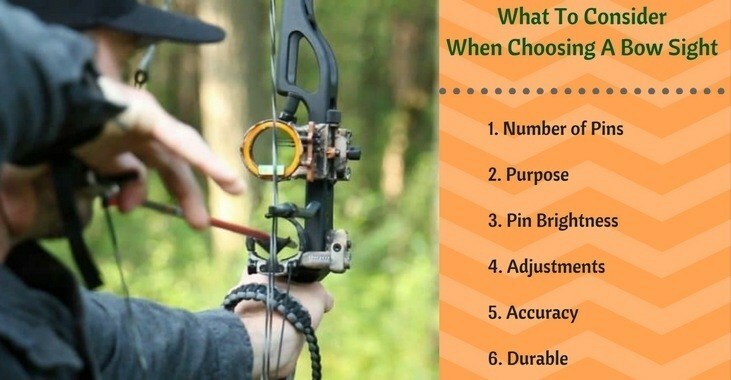 That said, here are a few important factors to keep in mind when shopping for a bow sight. The first thing you want to decide for yourself is whether you want a single pin sight or a sight that has multiple pins. Single pin sights are usually adjustable. 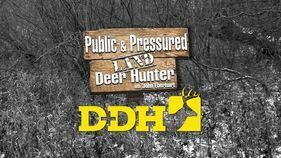 You can easily adjust it to whatever yardage your deer is. They come with a side tape that let you adjust the sight up and down at any distance you are aiming at. The best thing about single pin is that it offers you just one aiming point so that your scope of view is not cluttered by other pins that could block your target. However, one of the potential downfalls of the one pin is that you have to set it before you draw your bow. So, if the deer come in a certain yard, you have to set your sight before you can shoot the deer. Of course, this can make the deer notice some movement and can get you busted. On the other hand, multi-pin sight has different pin numbers like 3, 5, and 7 pin sight that you can set with the most modern compounds to 20-60 yards. 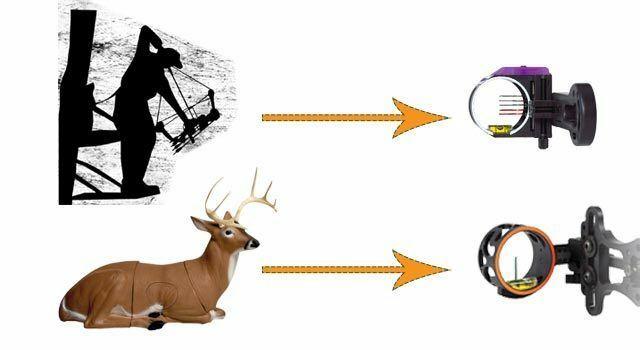 So if the deer is 20 yards away, you can just draw your bow with a 20-yard pin without doing anything differently and with less movement. The moveable pin sights are great for a tournament or 3D shooting. Also, keep in mind that some models require much time to practice, so ensure you find out how long it will take you to get the hang of using that particular bow sights. So, ensure you choose the type of sights that will work best in a particular hunting occasion before making the purchase. Consider if it has pins that can work at low light level. 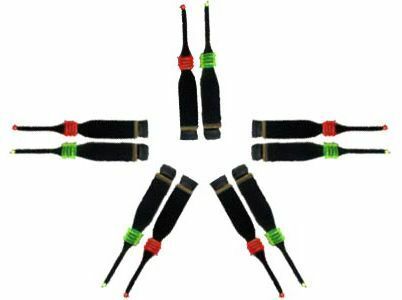 We do recommend bow sights that have fiber optic as the aiming pins. The more the fiber that is incorporated into the sight, and wrapped around the scope or, the lighter it gathers. These pins can react under highest light condition (halo effect) and can be transmitted to the very end to aim at a prey. For you to effectively aim at your target accurately in a windy atmosphere or in an elevated spot, you want to look out for a sight that has 2nd and 3rd axis adjustment. Ensure you go for the ones that come with hiding adjustments, micro adjust and precise adjustments. One more thing you want to consider is the size of the pins. The basic pin sizes in today’s sights range from 10,000 of an inch to 29,000. So, where this comes to play is that the smaller the pins are, the more precise you can be with your aiming. That means you can dial down exactly where you want that arrow to hit because it is so small. The larger your pin is, the more of your target it is going to cover, which most times can’t be quite as precise as you want it to be. Another thing to find out is how durable is the sight. A bow sight that offers an aluminum design , lightweight and sturdy should be a good pick. On the other hand, a plastic model that normally comes with a lower price isn't as sturdy and durable as an aluminum bow sight. So, we recommend you always go with the ones that offer a solid construction that can last you a lifetime. But, if you’re on a budget, then you can pick bow sights that combine the two types of design in one. They are also affordable and stronger than the plastic type of sights. If I’m in the market for a single pin bow sight, or for a bow hunting tournament, my prime choice will be the HHA Optimizer Lite 5519. Its solid design, and tool-free elevation and windage adjustments, which let you turn your optimizer easily in the field, are a force to reckon with. But if I were to look for a multiple pin bow sight for deer hunting, the IQ Bowsights Micro 3, 5 or 7 Pin Compound Bow Archery sight will be my best pick. This is due to its multiple features and unique design to shoot at prey in different yardage. Its revolutionary Retina lock system and the ability to adjust the individual pin to suit your shooting style earns it our Editor's Choice as the best bow sight for deer hunting. 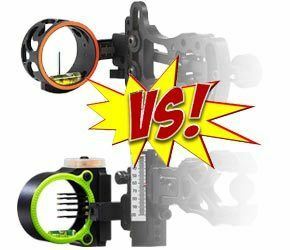 Apart from these two, there are other top rated bow sights on this list that deliver gorgeous and decent features. Take a closer look at them and see which one best suit your shooting style. 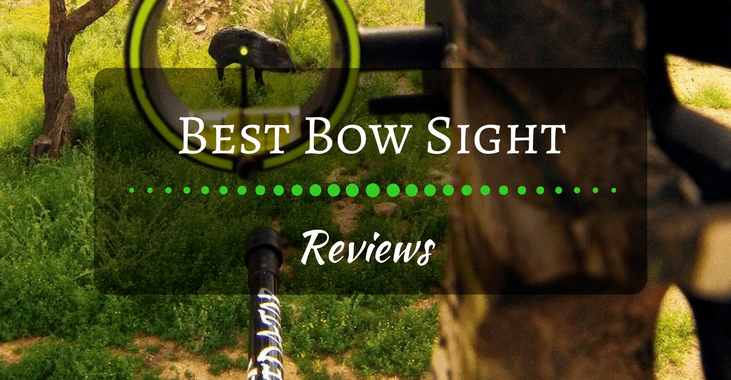 If you think we have missed an amazing bow sight that ought to be on this list, please do let us know.